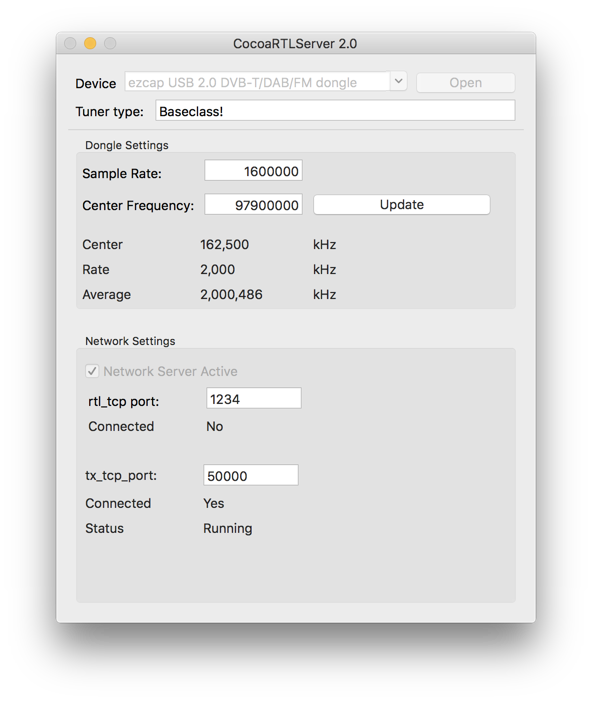 This app makes an RTL SDR dongle appear as a networked SDR, following the RF Space protocol. It works with SDR apps such as SdrDx. It also acts like rtl_tcp, so it can be used with Cocoa1090 and similar apps. The default port of 1234 for rtl_tcp works with Cocoa1090 and other apps that are designed to use the rtl_tcp command line app. The default port of 50000 for tx_tcp works with SdrDx and other apps that are designed for use with an RF Space SDR like the SDR-IQ or netSDR. If you want to change the ports, you need to quit and restart the app. The Sample Rate and Center Frequency fields and Update button are for use if you want to manually set these values, normally they are set by your SDR app. I've run it under Mac OS X 10.6, 10.10 and 10.11-10.13, It should run under 10.7-10.9. It only works with RTL devices with an E4000 or R820T tuner IC. This app was based on code in "Softshell", which used code from the rtl-sdr project. Both are GPL licensed, so this is as well. A copy of the source code files are incuded with the download, most users can ignore them.